ATTENTION DB COLLECTORS: We have had confirmation that Dorothy Bauer is no longer in business. Whatever is left on the website is all that we will be able to obtain. This is your opportunity to buy pieces from this wonderful line at reasonable prices, as this company's pieces will surely appreciate in value if no longer available. 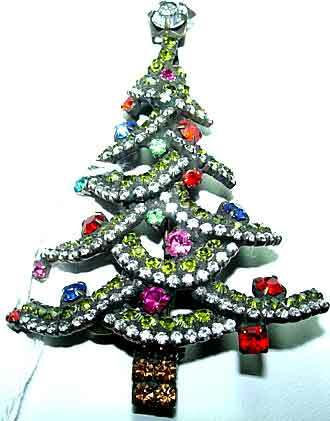 Description: Bauer Baby Have A Ball Tree Pin - A smaller (1 3/8" x 1") version of the Have a Ball tree. This one is done in sapphire rounds and sapphire aurora borealis chain. Base is fluted metal in antiqued silvertone. 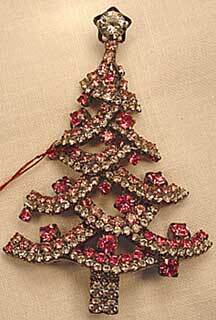 Cute with the larger tree, or fine by itself if you don't care for larger jewelry. 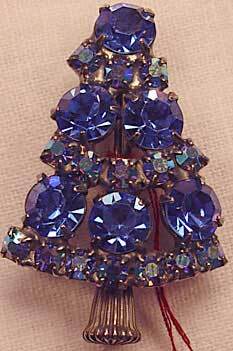 Description: Bauer Tree of Posies - If you love flowers and butterflies, this Christmas tree pin will be right up your alley. Six pyramidally set "flowers" of emerald green rhinestone petals and hyacinth centers are rimmed with clear rhinestone garland, and topped with a clear rhinestone butterfly. Set in goldtone, all stones are prongset. The base is a double rondelle, so you can use this as a free-standing decoration when you aren't wearing it. 2.75" top to bottom and 1.5" at the widest point. 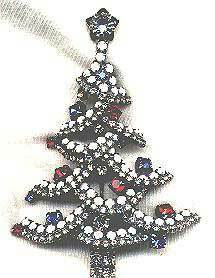 Description: Bauer Patriotic Criss-Cross Christmas Tree - Same design as the above tree, but done in chalk white and clear stones and accented with red and blue "balls". Antique Silver. Due to the Swarovski company's discontinuance of chalk white rhinestones, this is now a limited edition piece. $92.00 Two available. A very dynamic tree in person. Description: Bauer Criss Cross Tree in Pink - The same design in a popular and hard to find tree color - pink! Rose and blush pink rhinestones are combined with clear rhinestones in an antiqued silvertone setting. This particular tree even has a bail attached, so you can wear it on a chain, wire, or small diameter omega as well as wearing it as a brooch. Description: Bauer Swirl Tree - This 2 1/2" x 1 3/4" tree is not only 3-D but free standing, so you can wear it or display it standing upright. Done in emerald green stones with pastel rhinestone accents and a clear rhinestone for the star, it is set in antiqued silvertone. 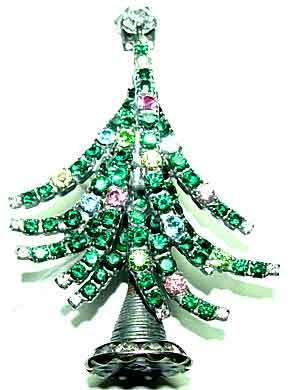 Description: Bauer Large Navette Christmas Tree Pin - With so many wonderful trees to choose from in Dorothy's line, it is difficult to choose a favorite, but for me this one ranks right up there. 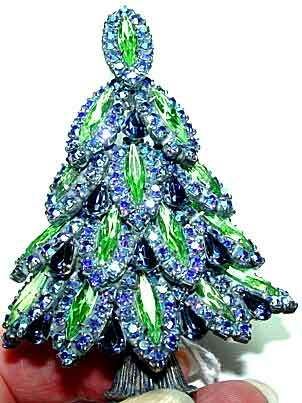 A substantial 3-D tree, this pyramidal style has five rows of navette (marquise) rhinestones in peridot surrounded by blue aurora borealis stones and separated by montana (navy) blue teardrops. Set in antiqued silver, it measures 3 3/8" x 2 1/2" x 1/2" and is free-standing for display. A fantastic addition to your jeweled forest. Other color combinations available. Limited Edition. 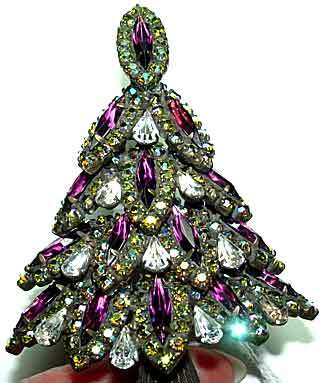 Description: Bauer Large Navette Christmas Tree Pin in Amethyst - Same design and dimensions as the above tree, with amethyst marquises, clear pears and colored aurora borealis chain trim.